Achieve Strategic Diversification | Atlas Capital Management Corp.
Atlas offers multiple proprietary investment strategies designed to not only maximize returns but to also, and more importantly, minimize client risk during a market downturn. Because our individual strategies have shown different results in varying market conditions, we recommend that clients utilize more than one strategy to diversify their portfolios. Using a blend of Atlas Capital strategies, we have the capability to create custom portfolios to meet each client's specific needs. Please refer to the five Custom Portfolio Samples below. Each sample uses a beginning date of January 2008 and compares different combinations of our most popular strategies to the S&P 500 through the most recent month end (Sample I uses a combination of S&P 500 and iShares Aggregate Bond Fund and Sample V adds the American Funds Growth Fund of America as a benchmark). Page one can be customized to the financial adviser. Page two consists of a pie chart illustrating the various strategies, a graph depicting the growth of $100,000, recent performance (rebalanced biannually), rate of return (net of management fees, custodial fees and trading costs), risk table and maximum drawdowns. Page three includes important information. What many financial advisers like most about the Atlas custom portfolios: Max Drawdown and Beta numbers are significantly less, shorter recovery time, and the cumulative return is greater than the S&P 500 Index. Over the last two major stock market downturns (2000-2002) and (2007- 2009), the strategies have shown to be very resilient to significant losses for our clients. Atlas recognizes that one of our most effective tools to improve performance is the use of active management to successfully minimize losses and allow client portfolios to outperform the broad market indices over a full market cycle. Custom Portfolio Sample I: This sample portfolio is comprised of the following strategies: 10% each Classic, Equity Growth, High Yield, Perpetual Equity Growth, Quest, Perpetual World Equity Growth, 20% Fixed Income, 6% Elevation, 4% each Aviator, Crescendo, 2% each Oil, Gold, Silver. The illustration provided should not be construed as investment advice nor should it be considered as a recommendation. Custom Portfolio Sample II: This sample portfolio is comprised of the following strategies: 11% each Classic, Equity Growth, Perpetual Equity Growth, Perpetual World Equity Growth, 10% Quest, 8% Elevation, 7% each Aviator, Crescendo, 5% each Fixed Income, Govt Long/Short, High Yield, 3% each Oil, Silver, Gold. The illustration provided should not be construed as investment advice nor should it be considered as a recommendation. Custom Portfolio Sample III: This sample portfolio is comprised of the following strategies: 10% each Classic, Equity Growth, Perpetual Equity Growth, Quest, Perpetual World Equity Growth, Aviator, Crescendo, Elevation, 5% Govt Long/Short, 4% each Oil, Silver, Gold, 3% Precious Metals 1.0X. The illustration provided should not be construed as investment advice nor should it be considered as a recommendation. Custom Portfolio Sample IV: This sample portfolio is comprised of the following strategies: 12% each Aviator & Crescendo, 9% each Classic, Equity Growth, Perpetual Equity Growth, Quest, Perpetual World Equity Growth, Elevation, 5% each Oil, Silver, Gold, 4% Precious Metals 1.0X, 3% Precious Metals Long/Short. The illustration provided should not be construed as investment advice nor should it be considered as a recommendation. Custom Portfolio Sample V: This portfolio we consider equally weighted in 8 of our core Strategies and 3 of our non traditional: 11% each Classic, Equity Growth, Perpetual Equity Growth, Quest, Perpetual World Equity Growth, Aviator, Crescendo, Elevation, 4% each Oil, Silver, Gold. The illustration provided should not be construed as investment advice nor should it be considered as a recommendation. The referring broker-dealer or investment adviser maintains the initial determination of client suitability for the Atlas investment strategy(ies) selected. In periods of severe market declines when asset classes tend to become highly correlated, cash can be used as an asset class to preserve capital in many of the Atlas strategies. Details of each strategy can be found in the Investment Strategies section under What We Do and also in the ADV Part 2A. Tactical Strategies are based on the oldest of market realities —it makes sense to be invested in rising markets, while in falling markets it is better to remain on the sidelines. Designed to be 100% invested when the model is positive and 100% cash when the model is negative. Atlas’ Rotational Strategies are designed to capitalize on the tendency of asset classes and broad market segments, such as growth and value stocks, to excel at different stages in economic and business cycles. Depending on market conditions, they could be 100% invested in one asset style, diversified among styles or could move to 100% cash or money market instruments. The ability to move to cash proved its merit in the 2008 market downturn. Atlas’ Fixed Income Strategies may use mutual funds and/or ETFs that concentrate their investments in some or all of the various fixed-income sectors such as money market, long-term treasury bonds, international bonds, corporate bonds, high-yield bonds or emerging- market bonds. Our goal is to provide investors with better returns than could be achieved by owning any one of the debt classes alone, with less risk. Our two Traditional Strategies use an active investment approach and are continuously invested - one invests in the U.S. equity markets only, and the other in U.S. and International equities. These strategies do not use cash as an investment option. They are designed to constantly adjust to market conditions and strive to identify asset classes and market segments with the best performance potential. The Atlas Non-Traditional Strategies may use leveraged, inverse, precious metals, gold, silver or oil mutual funds or exchange-traded funds (ETFs) as investment options and may not be suitable for all clients. It is the policy of Atlas to limit client’s investment to no more than 50% of their investable net worth in these strategies. 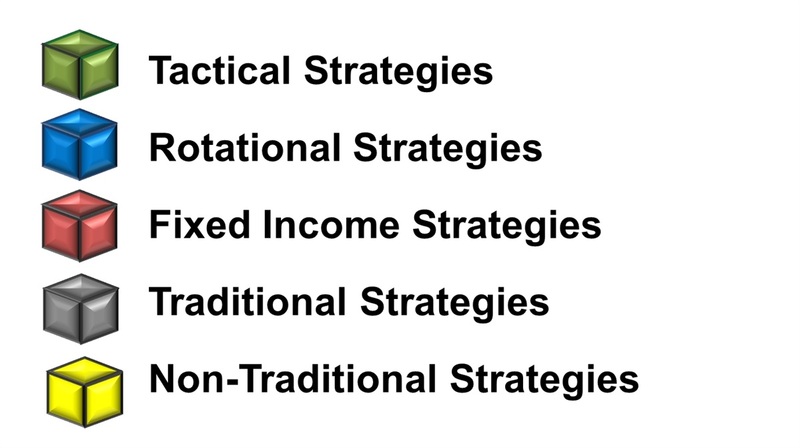 Because our individual strategies have shown different results in varying market conditions, we recommend that clients utilize more than one strategy to diversify their portfolios. Our objective is: to outperform a buy-and-hold position with less volatility over time. Just as few companies or mutual funds excel in every market environment, few investment strategies excel all of the time. Profitable investing requires understanding the strengths and weaknesses of your investment approach. There is no one "right" way to invest, but there are many wrong ways. Successful investors are those who choose an investment philosophy they understand, with a risk level they can accept, and are willing to allow the strategy the time needed to be successful.